Star Wars: The Force Awakens is still going strong as we head into the Christmas weekend. And if there's one toy that will be under a million trees this year, it's the App enabled remote control BB-8. Fans love this new addition to the Star Wars universe, and he was a hit before the movie even opened last weekend. First introduced over a year ago in the teaser trailer, this Astro-Mech droid rolled onto the scene stealing hearts and winning the praise of even the most hardened fanboy. And he plays quite an important role in Star Wars 7. We have three new pieces of concept art, which show off early ideas for what this droid could have been. The first image deviates the most from what we see on screen, giving BB-8 a bigger roller ball. But it seems J.J. Abrams knew what he wanted from the get-go. These images come from the new book titled The Art of Star Wars: The Force Awakens, which is available now at online retailers and book stores across America. And it makes the perfect companion piece to that remote control BB-8 on anyone's list. The book itself is a deep dive into all the early concept art, and it features plenty of advanced character sketches and abandoned ideas. It explores landscapes, planets, ships and a vast catalogue of new alien species. But BB-8 lovers are going to turn to the pages we've included here first. BB-8, which, according to the StarWars.Wikia, is sometimes spelled Beeby-Ate, is a BB unit astromech droid operating approximately thirty years after the Battle of Endor. In the movie, we are first introduced to BB-8 on Jakku, where his adventure begins. It has a domed head, similar to the R2 series astromech droids, with the bulk of its body made up of a ball. The droid belongs to Resistance pilot Poe Dameron, and is able to fit into a T-70 X-wing fighter's droid socket. In Star Wars: The Force Awakens, the droid carries a missing map piece that will lead to the location of missing Jedi Luke Skywalker. When this little rolling ball droid was first introduced in last year's teaser trailer, many believed he was a CGI effect. That is not the case, however impossible it may seem. BB-8 himself is a technical marvel, a practical effect that was on set with the actors as they shot. Neal Scanlan is the mastermind behind BB-8's floating head. He also did effects for Prometheus, and has an animatronics resume that includes effects for Babe: Pig in the City, The Little Shop of Horrors, and Jim Henson's Creature Shop. But BB-8 might be his crowned jewel. One of the big casting secrets behind Star Wars: The Force Awakens was that someone actually helped voice the new ball droid BB-8. While most assumed BB-8 was speaking in various beeps and tones produced by a computer, that is not true. Former Saturday Night Live cast member and actor Bill Hader helped created the persona behind this scene stealer. And he had a partner in Ben Schwartz, best known for his recurring role as Jean Ralphio on Parks and Recreation. Both Ben Schwartz and Bill Hader are credited as 'BB-8 Voice Consultant' in Star Wars: The Force Awakens. But before any of that could happen, he had to be designed and created from scratch. 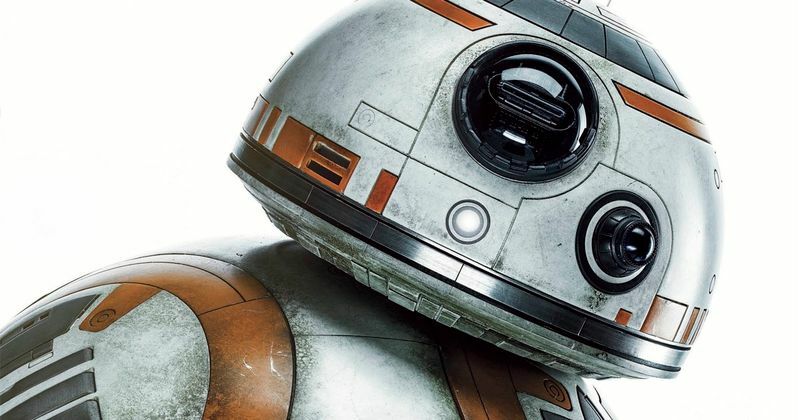 Take a look at what BB-8 almost looked like.